Held the first Saturday in October each year, Sunset at Sunset is the Town of Sunset Beach’s Community Block Party. This year’s festival will be held October 6th, 2018 from 10 am to 5 pm! It’s the 12th year for the festival, which is free to all attendees and boasts numerous vendors from artists to writers, charity booths and local community organizations to local wineries and restaurants. The festival also had several bands playing some great beach music all day long, which may inspire a little shagging on the dance floor! Great food, great fun, and great people! Staffed by volunteers, what began as a small event on the beach has grown over the years and now uses the entire area between the Food Lion shopping center and the Ingram Planetarium. More than 100 vendors, crafters, food services, and non-profit organizations participate in the day’s activities. Only good quality goods are permitted to be sold and year after year the variety of items continues to expand. Throughout the day high-quality bands entertain attendees. A photography contest is held each year and a 5K Run/Walk over the Mannon C. Gore Bridge is a highlight of the day. 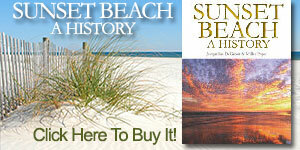 Please visit www.sunsetatsunset.com for additional information. The 38th Annual North Carolina Oyster Festival will feature local cuisine, arts and crafts, children’s activities, live music, an oyster eating contest, shag competition, the Oyster Shucking Contest, and the delectable Oyster Stew Cook-off. The beach center becomes a walking district that offers something for everyone: local cuisine, arts and crafts, children’s activities, live music, Oyster Stew Cook-off, and the Oyster Shucking Contest. The ‘Fest is made possible by the Brunswick County Chamber of Commerce and the support of many generous area businesses and a wonderful group of volunteers and, most importantly, the weekend’s dedicated revelers. Festival-goers can enjoy watching the shuckers compete for the title of 2018 North Carolina Oyster Festival Shucking Champion on Saturday and on Sunday taste the best of the best as the competition heats up for the Oyster Stew-off. Bring your chairs and enjoy the lineup featuring popular beach bands, cover bands, and everything in between. Saturday, October 20th 2:00 pm. Sunday, October 21st 12:000 pm. People choice judge fee $5. The last full weekend in October, the Holden Beach Merchants Association hosts the very popular “Holden Beach Festival By The Sea”. This 2-day event, October 27th & 28th, 2018, kicks off with a parade down the Holden Beach Causeway. This is the only day of the year that you can walk across the Holden Beach bridge and each year several hundred enjoy this time to take pictures and view our beautiful waterway. Arts and Crafts vendors are open from 9:00 am to 5:00 pm on Saturday and 9:00 am to 4:00 pm on Sunday. You’ll want to plan to be onsite for a couple of meals and a snack or two from the Festivals food vendors. For the competitive people, there is a horseshoe tournament and a sandcastle building contest. Children enjoy face painting, huge kites flying overhead and the children’s fun areas. There is live musical entertainment both days at Holden Beach’s Pavilion. Wilmington’s Riverfest is November 17th & 18th and takes place in Historic Downtown Wilmington on Water Street from the foot of Market Street to Cape Fear Community College. COMPETITIONS • EXHIBITIONS • AND MORE! Currently drawing nearly a quarter-million people, this free, family-oriented celebration is a two-day event and has grown to be a widely anticipated annual celebration. Riverfest was created in February 1979, by a group of Wilmingtonians interested in showcasing downtown Wilmington and the Cape Fear River and has since resulted in a cultural street festival that entices locals and tourists alike to our amazing Historic Downtown. Riverfest boasts craft vendors, concessions booths, a children’s play area, entertainment on various stages, Saturday night fireworks, and more. This year, we will also be crowning our third Annual Miss Riverfest. One well-deserving young lady will be crowned and perform hostess duties throughout the festival. Nothing says “festival” like the smell of turkey legs, waffle cones, and popcorn. Several vendors come from all over to provide festival-goers with all the gooey, greasy goodness that is festival food. Along with the food vendors are several artists selling their art and often showcasing their skills. Everything from paintings to wood carving to jewelry to sculptures can be found in booth after booth for you to take home and treasure. The number of commercial vendors is kept low so that the artists can be front and center… after all, this is called “Art on the River”! The Saturday night fireworks display is a family and festival-goer favorite. Standing on the boardwalk overlooking the Cape Fear River and the Cape Fear Bridge, you will be amazed at the spectacular light show! So make sure to corral all the kids and head on down to the waterfront for this free show! What’s better than listening to live music on the river? Oh, yeah….FREE live music on the river! Showcasing local musicians and bands, Riverfest makes it a point to provide all different styles of music. Dozens of bands will be performing everything from bluegrass to classic rock to jazz. Come support our local artists. Nothing goes better with live music and fresh air like a good cold beer! Riverfest provides a Beer Garden where you can mingle with your friends and sing along to the great music. If you are a classic or vintage car fan, step right up to Market Street. Dozens of cars and trucks will be on display along with their dedicated owners. Ask questions, get a picture taken with one, and imagine yourself driving down Route 66 in one of these beauties! Come on down to beautiful, Historic Downtown Wilmington, NC and spend a couple of days by the Cape Fear River where we will be celebrating our amazing community. See you there!